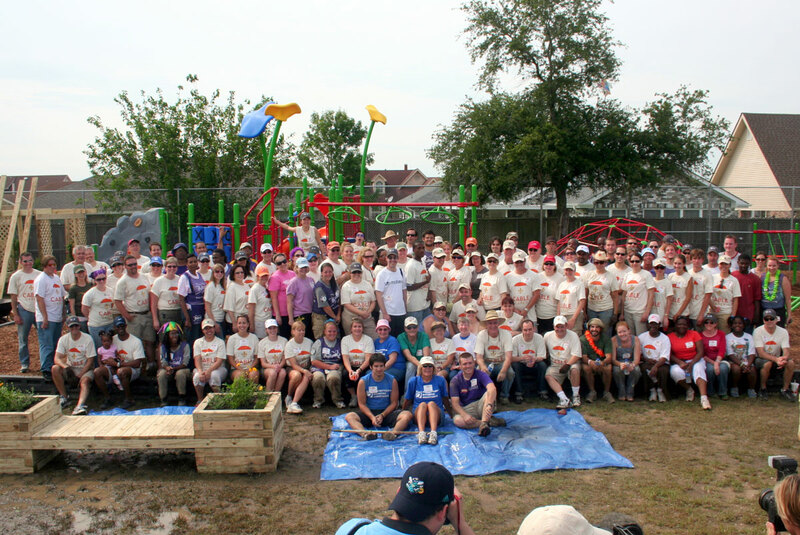 Operation Playground put Gulf Coast kids first | KaBOOM! When Katrina devastated the Gulf Coast's roads, homes, schools and businesses KaBOOM! launched Operation Playground. Not to rebuild those all-too-important streets and homes, but to help rebuild childhoods. Through Operation Playground and the years following that campaign, KaBOOM! 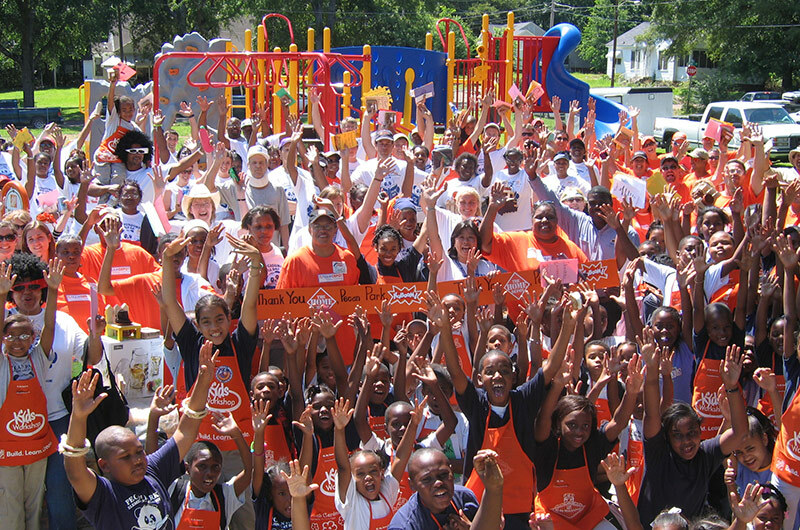 has channeled more than $27.1 million and mobilized 43,791 volunteers into the Gulf Coast to build playgrounds and restore childhoods. 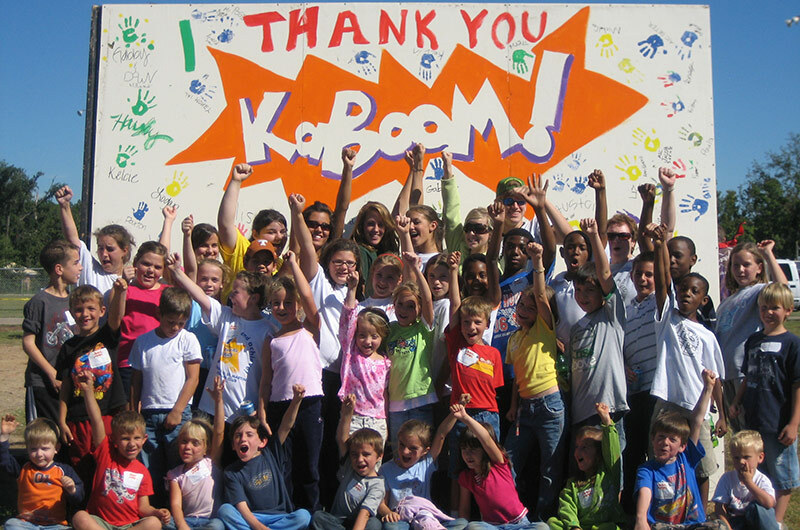 KaBOOM!, alongside tens of thousands of volunteers, has built over 194 playgrounds in the Gulf Coast, serving 293,929 kids. View our infographic for more information. 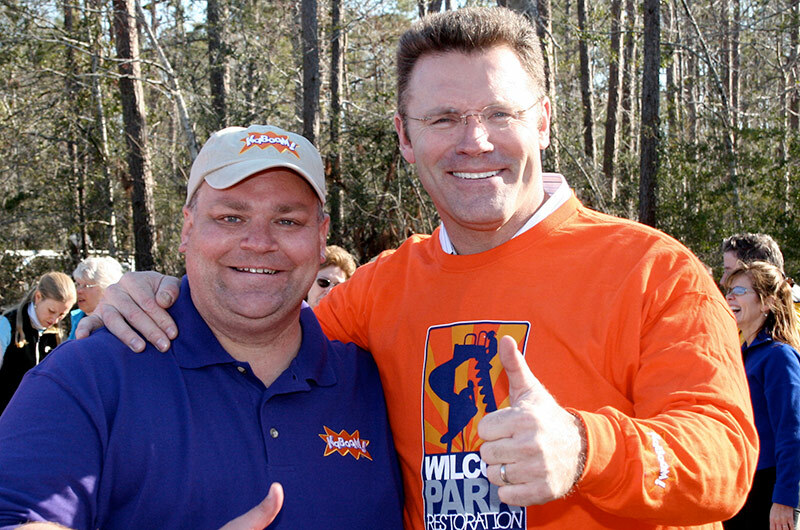 Foresters, The Home Depot Foundation, The Walt Disney Company, DJR Foundation, NBA Cares, W.K. Kellogg Foundation, The J. Willard and Alice S. Marriott Foundation, Fannie Mae, ING Direct, Starbucks and many others, continue to invest in the region to this day. By Sarah Pinsky, Director of Account Mangement, KaBOOM! 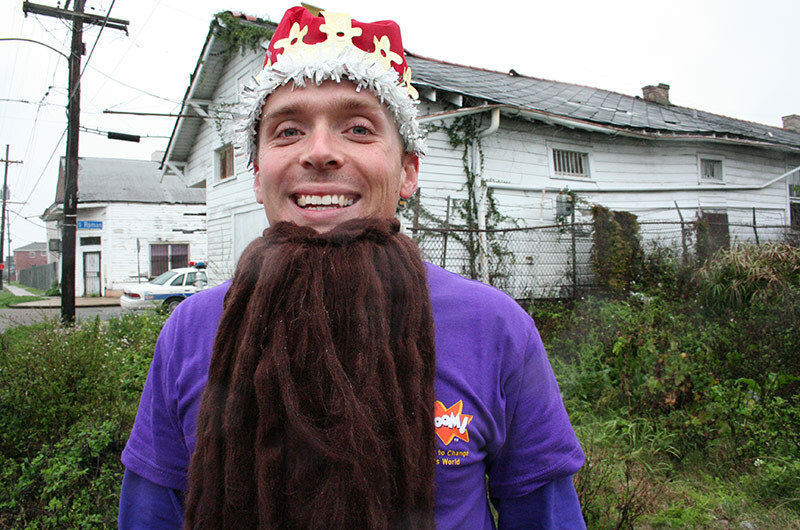 As Director of Operation Playground for KaBOOM!, I saw a lot in New Orleans and the Mississippi Gulf Coast following Hurricane Katrina, but I'll never forget the first time I saw 'Play World' in New Orleans. It was a hot summer night in 2007. It was dark outside and too late to be conducting site visits in parts of the city I didn't know, but I heard there was a neighborhood with a lot of kids that really needed a playground and I wanted to check it out before I flew home to Chicago the next day. As I did for most of my site visits, I was driving the KaBOOM! van that night – a not-inconspicuous purple and orange mini-van with giant KaBOOM! logos on the hood and sides. It definitely left a lasting impression! When I turned down the dark street heading toward Guste Homes, I saw a small crowd in the road and felt afraid. My bravado vanished as I began to question the wisdom of being out by myself in a city struggling with crime that still lacked street lights. There was no way to turn around, though, so I drove resolutely ahead, my heart pounding with fear. As I pulled closer, I was struck by the unmistakable sound of kids playing and laughing. I saw a large crowd of women and children gathered together at an intersection. My fear vanished as I heard people cry out, "It's the KaBOOM! lady," and "Are you going to build us a playground?" Of course, I had to pull over. When I got out of the car, I was immediately surrounded by tiny kids high-fiving me, hugging me and telling me they needed a playground. I couldn't help but laugh as my fear was completely replaced by joy. 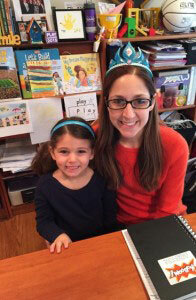 One of the moms came over – I think to rescue me from the throng of kids – and I asked her what was going on. She told me she and some other moms created a play area because the neighborhood didn't have one. 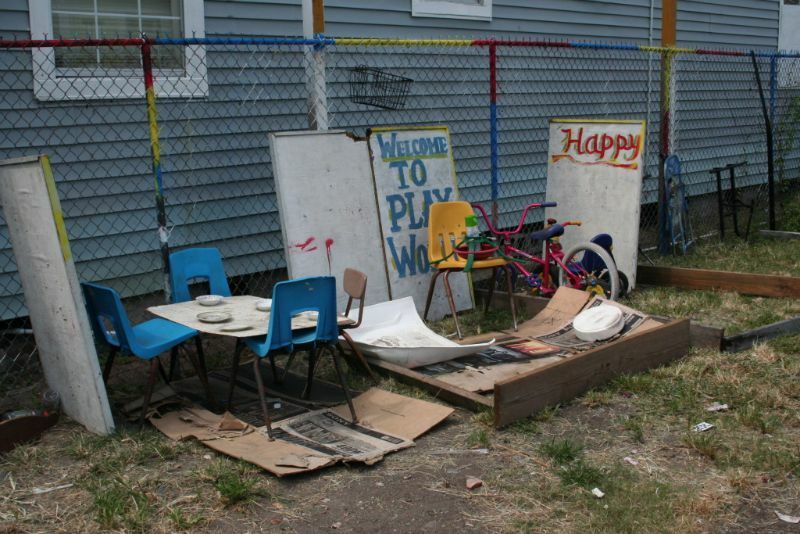 This was a play date in post-Katrina New Orleans. "That was when I saw 'Play World' for the first time." It was a small corner lot, overrun with weeds, seemingly littered with broken toys and play equipment. The mother explained to me that the kids didn't have a playground so they made one with whatever they could find. It wasn't pretty, she said, but it was the best they could do. There was a small table and chairs for playing house, a bike without wheels stuck in the dirt and a makeshift sliding board made out of a piece of plywood propped up against some crates. The moms had also painted cheerful signs that said 'Welcome to Play World' and 'Happy.' With a small crew of kids as my tour guides, I got to walk through Play World and see everything up close. Each child had a story to tell about their favorite part of Play World. Their enthusiasm for this small, imperfect place brought tears to my eyes. It still does. In many communities, this lot would be considered dangerous and off limits, yet here it was a sacred place where these kids, who had already endured so much, could just be kids. A place lovingly built by parents who knew their kids needed a place to play. I stayed and talked to the moms and kids for more than an hour. They knew all about KaBOOM! 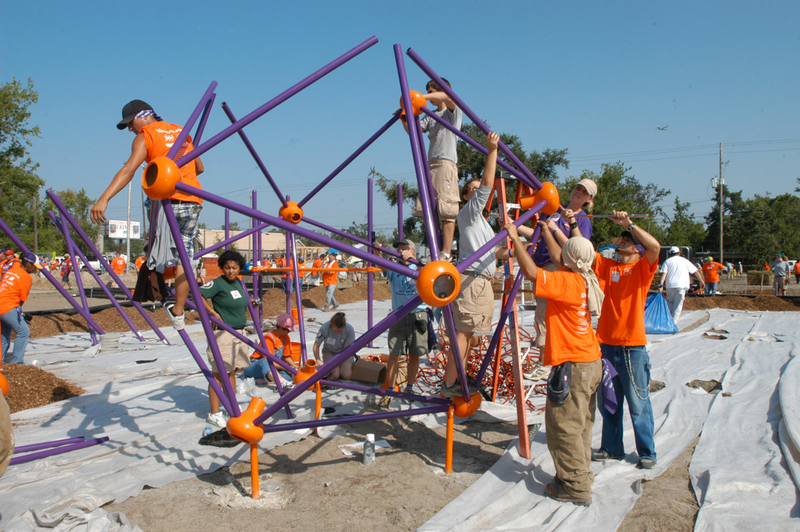 – that we had created Operation Playground right after Katrina to rebuild playgrounds across the Gulf Coast, that we had already built several playgrounds in New Orleans, and that we were looking for new sites for future projects. Over and over again they told me how important our playgrounds were to helping their kids be kids again. They talked about being displaced from their homes (still), the challenges of living in a rebuilding city, and the storm-related anxiety and stress their kids felt even now, a couple years removed from the hurricane. They told me how much a new playground would mean to them and how it could help their children escape the stress of their daily lives and heal. What they knew instinctively is backed up by research that says following a disaster, play can help mitigate the impact of toxic stress that children experience. That night I committed to finding a way to build a playground in their neighborhood and I'm proud that KaBOOM! did, along with 90 others across New Orleans and 194 across the Gulf Coast following Katrina. I think about that night often. As a mother now, I have such deep admiration for those moms and for parents just like them who have prioritized play for their kids after a disaster to help restore normalcy and give kids the childhoods they deserve. 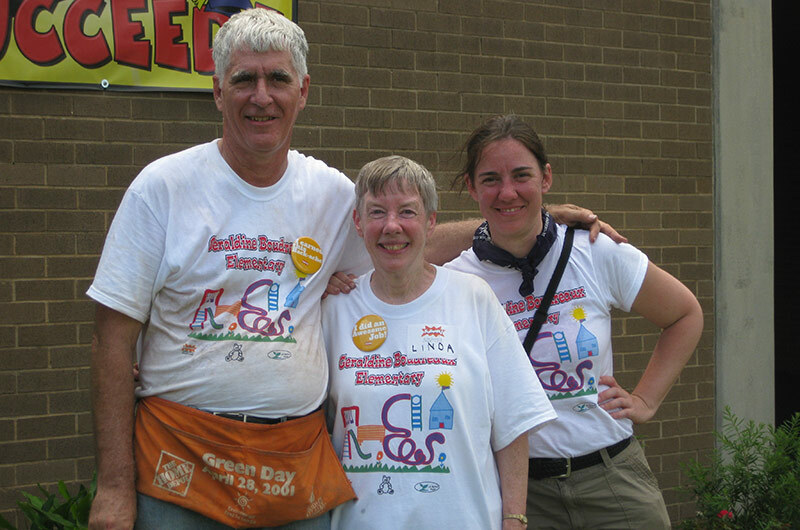 Parents like Ginny Reynolds, who reached out to KaBOOM! days after Katrina, urging us to build a playground in Bay St. Louis, Mississippi, which we did, just 110 days after the storm on December 17, 2005. Starting with that first Operation Playground project, KaBOOM! 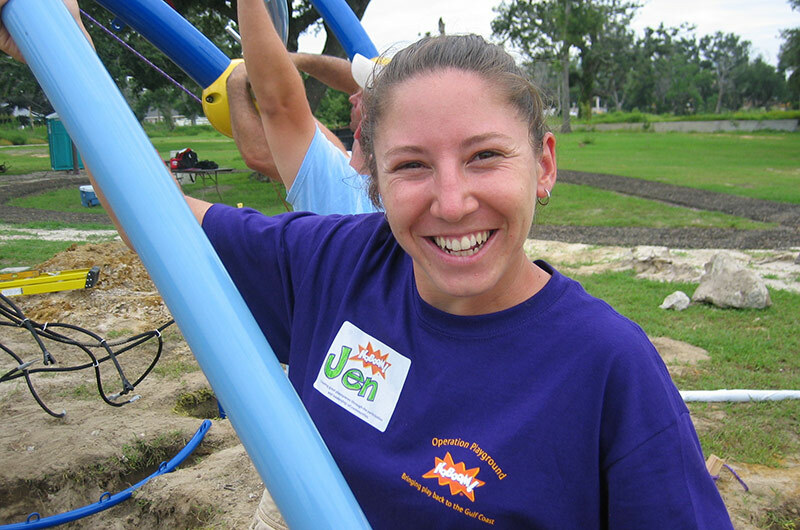 directed more than $27.1 million into playspaces across the Gulf Coast and mobilized more than 43,000 volunteers who braved the heat (and rain!) to help transform empty lots from Houston to New Orleans to Biloxi to Mobile into safe and fun places for children to play. We couldn't have done it without them. 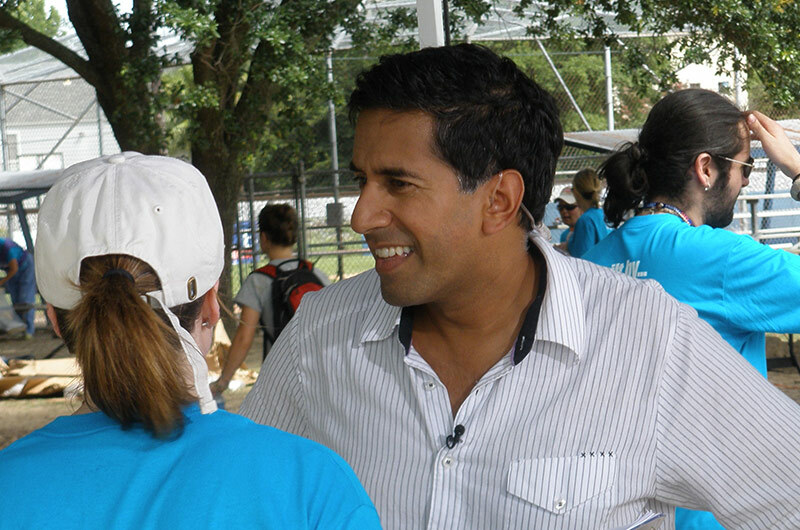 With the 10th anniversary of Hurricane Katrina upon us, I'm enormously proud of the work we did in the Gulf Coast. 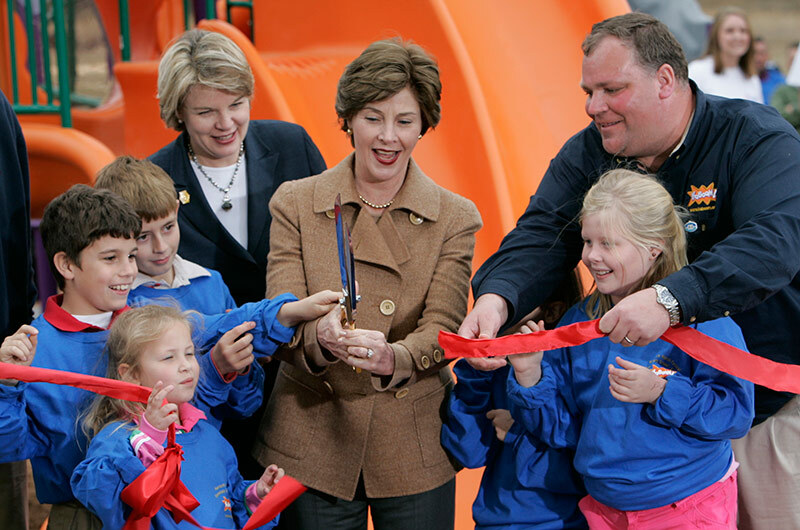 Our mission was simple – to help rebuild playgrounds in communities impacted by the storm – but it required a broad coalition of companies, foundations, volunteer groups and individuals to make it happen. There are too many organizations and people to thank by name but we are so grateful to everyone who stood with us contributing time, talent or treasure. Congratulations to Hancock County School District and Lycée Français de la Nouvelle-Orléans for winning our Operation Playground contest. Hancock Country Schools will be receive an Imagination Playground™, courtesy of The CarMax Foundation, and Lycée Français is receiving a Rigamajig set. All of the finalists are model communities in the Gulf Coast putting kids first with play. Learn more about all the finalists. 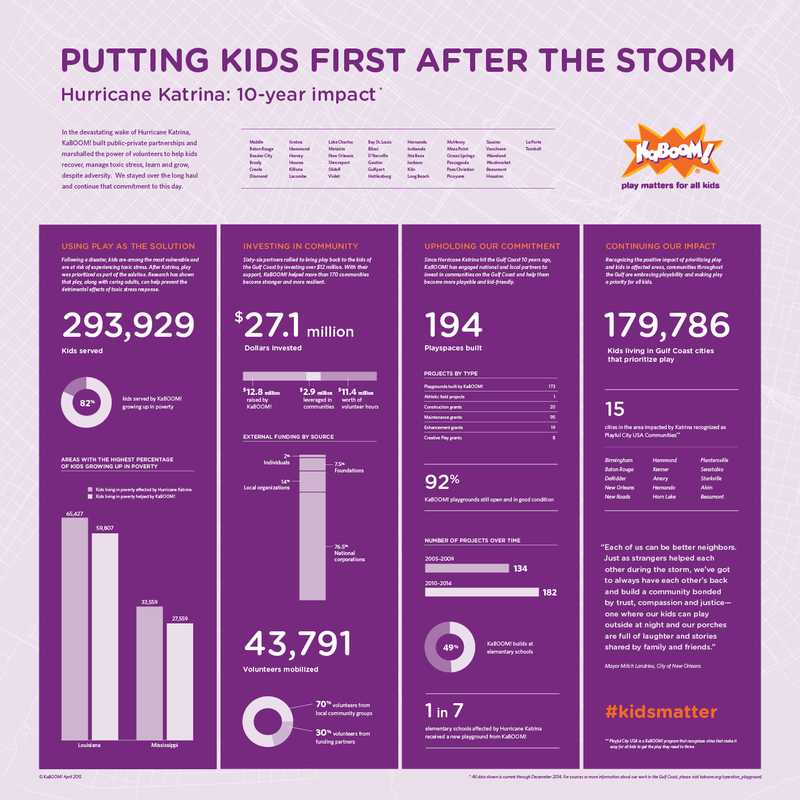 Kids depend on the overall health of their family, parents, and/or caregivers to thrive but during a disaster, adults' focus naturally shifts from kids to more pressing needs such as shelter and food. Unfortunately, this shift can hurt relationships previously built between adults and children. Imagine waking up one morning as a kid and not recognizing your neighborhood. You step outside and look across the street only to notice your neighbor's house is gone. You look to your left and you see a couch upside down on your cousin's lawn. You look to your right and see a tree coming out of your neighbor's roof. Further down, you see toys just floating down the street. You run back inside to talk to your parents but no one is there. According to the Center on the Developing Child, Harvard University, toxic stress response can occur when a child experiences strong, frequent, and/or prolonged adversity without adequate adult support. This kind of prolonged activation of the stress response systems can disrupt the development of brain architecture and other organ systems, and increase the risk for stress-related disease and cognitive impairment, well into the adult years. This is the effect "the single most catastrophic natural disaster and costliest hurricane in U.S. history," had on children in the Gulf Coast1. Disasters don't just cause widespread loss and suffering, they also disrupt normal daily routines for kids and families2. More than one million people in the Gulf Coast were displaced by the storm. "When the storm hit, everyone felt like they grew up fast. We felt like, 'oh, we're not five anymore, we're grownups now. We have to grow up to get through this situation that we're going through.' Whenever we were allowed to draw what we wanted on our playground, we were kids again, coloring and sharing crayons, and we got to put all our ideas together to have what kids have." Not only did Hurricane Katrina physically destroy the Gulf Coast, but it also negatively affected the psyches of kids who experienced its destructive forces first hand and survived. All kids regardless of their background, deserve access to balanced and active play every day so they can thrive. Ginny was born and raised in Bay St. Louis, a tiny town on the Gulf of Mexico about 20 miles west of Gulfport, Mississippi. When Katrina hit, she was living in Connecticut, but she had vivid memories of an earlier storm, Hurricane Camille, which battered Bay St. Louis back in 1969, when Ginny was just 9 years old. The destruction from Katrina sparked memories for Ginny who remembers vividly that after Camille, there was no play. 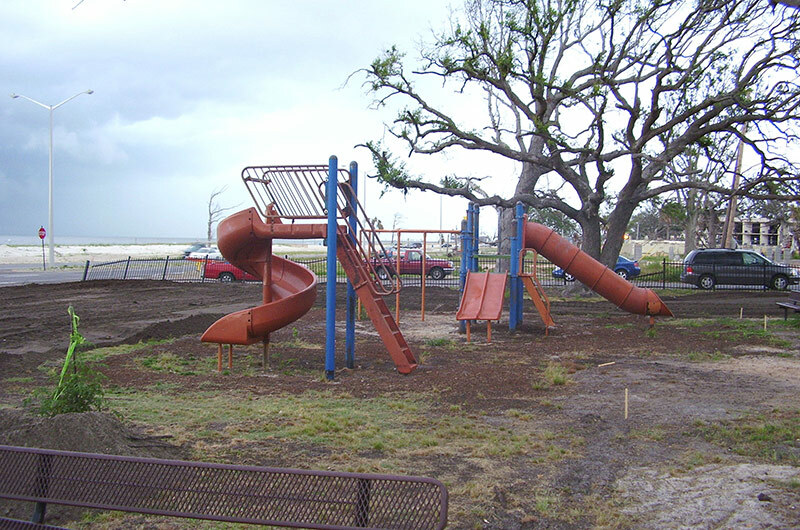 Playgrounds were debris piles. Kids had no place to simply be kids. So, they disappeared from the community. It took about 10 years to repair Bay St. Louis following Camille but people in town had to find ways to go on. Locals, especially Ginny Reynolds, never forgot. Looking back years later, she remembers being infuriated that the local playground was never rebuilt, that the kids of the region became an afterthought in the wake of the storm. "Unless you've lived through a catastrophic CAT 5 storm, it's hard to imagine how upended everything is. KaBOOM! was able to understand the community's needs and make progress happen." 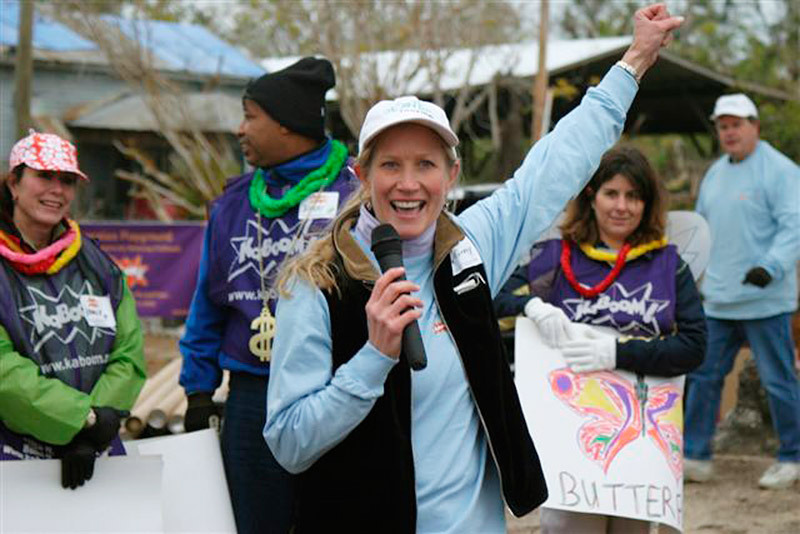 When Katrina hit, Ginny knew this was her chance to step up and make a difference in the lives of kids. She made it a point to convince the founder of KaBOOM! to come down to the Gulf Coast and see the site. As Darell Hammond flew into Gulfport, Mississippi, he remembers seeing a sea of blue tarps covering damaged roofs that ended abruptly as the plane neared the coast. The blue tarps simply weren't needed that close to the center of the storm's damage. There weren't any more homes to protect. On that day, Darell was convinced that KaBOOM! should bring play to the community and before you know it, KaBOOM! 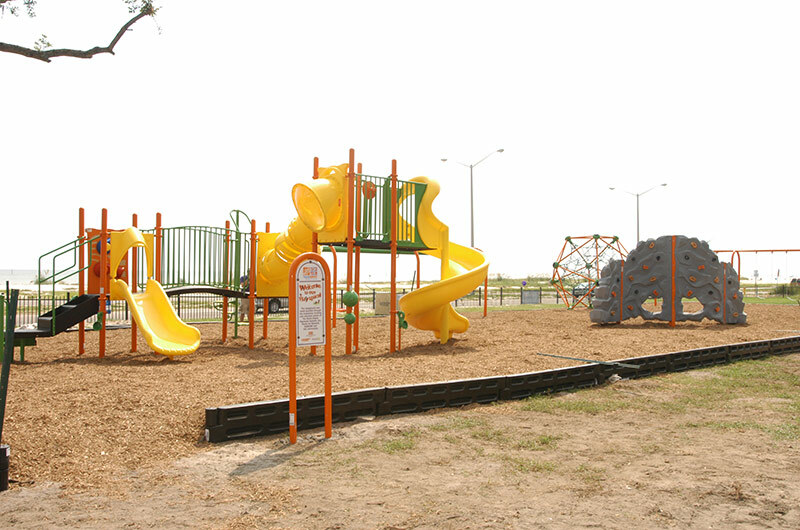 had a team in place figuring out how to build a playground for kids in Bay St. Louis. 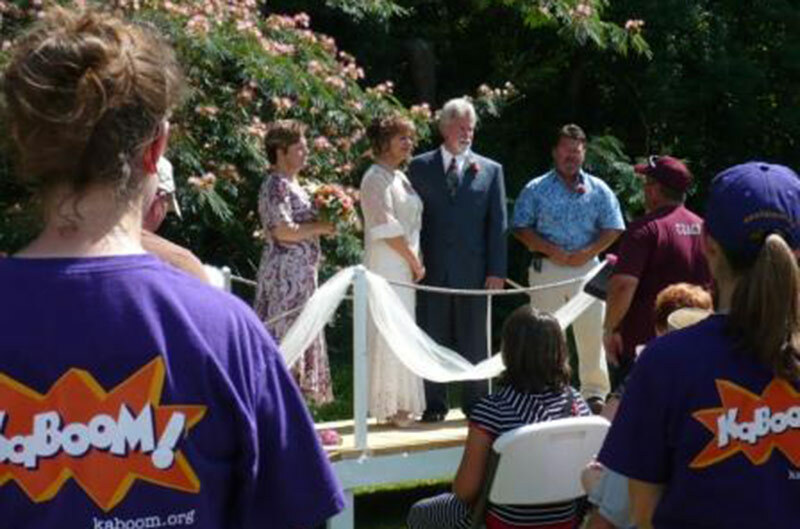 At KaBOOM!, we often say: "it only takes a single spark to start a fire." 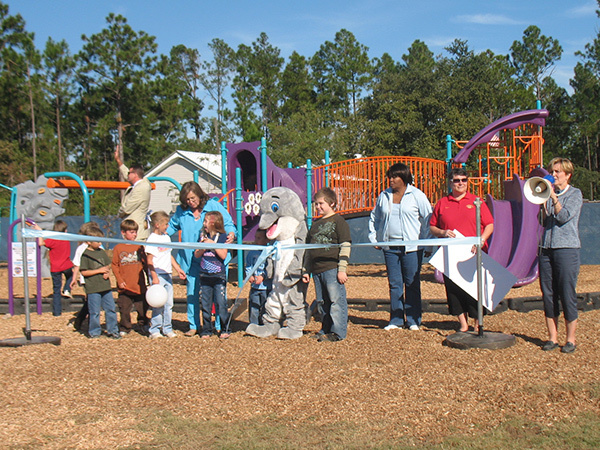 For the Gulf region, Ginny Reynolds was that spark and on December 17, 2005, we built the first playground after Hurricane Katrina. "As long as there is a need for playgrounds in Bay St. Louis, Gulfport, Pascagoula, New Orleans, and others, you can count on KaBOOM! to be your partner in play." 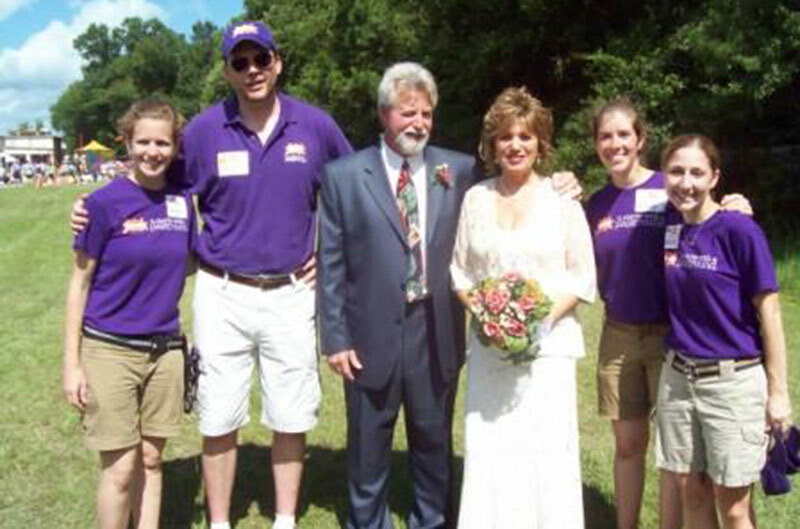 Hollie Kosbab was 5-years old and living in Mississippi when Hurricane Katrina hit. Here, she talks about the effect of the hurricane on her life and how her community put kids first during their rebuilding efforts. How did Hurricane Katrina affect you? Hollie: It was like the wind just pushed everything out of the way. There was nothing and no one after the hurricane. My family and I rode down the beach and there was just debris and trees all over the ground. We went to see our school but it was all gone. A lot of people left the area … those of us that stayed had to live in a tent and take cold showers every day. It was rough. It was too rough for a 5 year old to be put through. As a kid, how did you deal with the situation? Hollie: Honestly, I just wanted to play tag with my friends and play on the swing set after the hurricane hit but there was nowhere to do that. Nowhere to have fun and be a kid. All the kids were gone and we didn't have a swing set or a playground. We were moved to the Kiln Middle School but they weren't doing much better than us. We still had nowhere to play so we did the only thing we could: we went to the back, ran around and imagined things! As part of every KaBOOM! 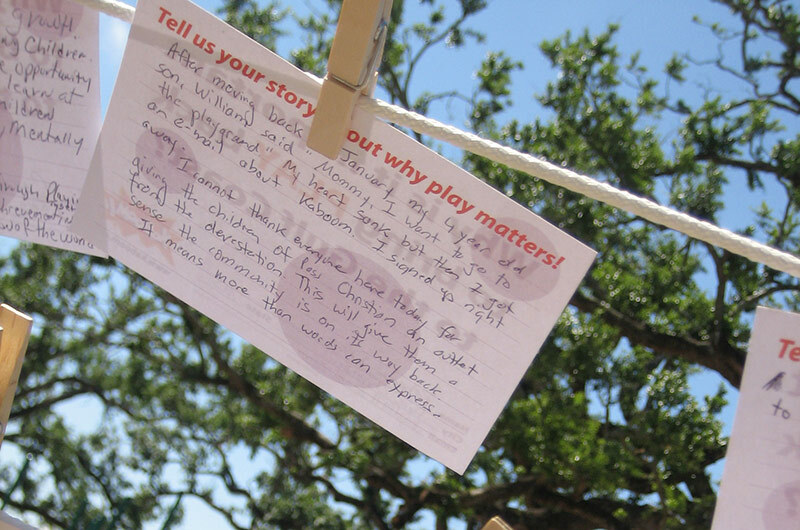 build, we ask kids to design their dream playground. What do you remember about that day? Hollie: When the storm hit, everyone had to grow up fast. I remember feeling that we couldn't be just 5 years old anymore; we had to grow up and deal with the situation. When we were allowed to draw our dream playground, we were able to be kids again. I remember thinking that all I wanted was a safe place to play. I felt like I was finally able to do something that will make me happy. On Build Day, when the playground was finally being built, how did you feel? Hollie: I remember that I couldn't sleep the night before because I was so excited to finally have a place to play! I just laid there and it just felt like Christmas, I felt like: I'm going to get one present … I finally get one present! How do you think having access to play has helped you? Hollie: I was always known as a social butterfly so having a playground helped me do that more and helped me interact with more kids. Whenever I was playing on the playground, and I saw a kid sitting all by himself, I was like hey, come play with me! Come push me on the swing, let me push you on the swing! Let's race up the spider web! I love helping people and having a playground helped me help other kids get the play they need to thrive. 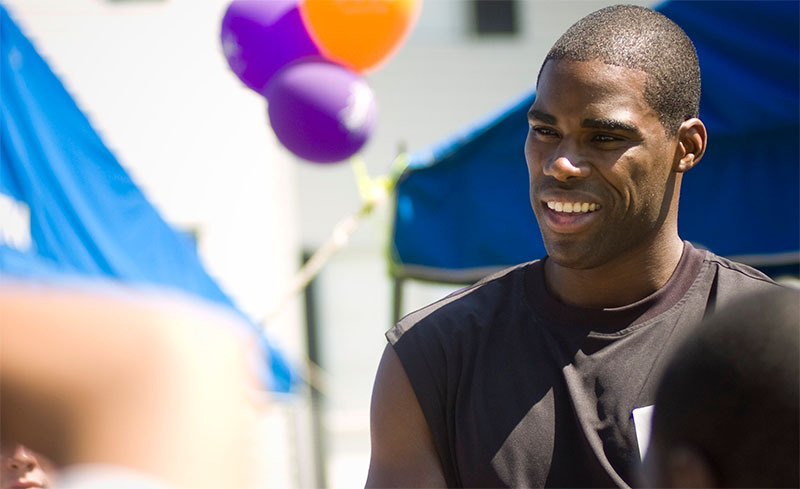 Antawn Jamison is a former NBA All-Star and is currently an Analyst for Time Warner Cable Sports/the Los Angeles Lakers. Antawn was introduced to KaBOOM! and the work we do when he was visiting New Orleans for the NBA All-Star weekend a few months after Katrina struck. Here, he talks about how that visit changed his life and gave him a passion for serving kids through play. Despite Hurricane Katrina having ravaged New Orleans and the Gulf area, (former) NBA Commissioner Stern decided to carry on with All-Star weekend there as planned. It was a controversial decision but he felt like it was something the city needed that would not only aid relief efforts but also help the people take their minds off of the destruction. The city was in ruins and this was the first major sporting event in the city since the storm. There was no shortage of community projects that needed major help. The project I was assigned to just happened to be a playground build hosted by KaBOOM! and the NBA at the Mahalia Jackson Early Childhood and Family Learning Center. That day I joined hundreds of people from the community, other players, NBA staff and the Commissioner to build a playground that would provide a safe play space for thousands of local kids who had lost theirs to the storm. As we worked to put the playground together piece by piece, I was reminded that it was on a playground that I remember meeting my first friends and began to love the game that would change my life. It also began to rain. But the rain didn't discourage anyone, it only reminded us of our goal and made us work together harder! That day I knew I'd found my charitable calling - to build playgrounds and inspire as many kids as possible to play outside no matter what!" After that build, Antawn reached out to KaBOOM! to fund a playground build in his hometown of Shreveport, LA! He went on from there to fund another build in the city where he currently lives, Charlotte, NC. He also participated in two other builds in Washington, DC (where he used to play with the Wizards) including a build with Michelle Obama for the 2011 Congressional Day of Service. As Executive Director of Trinity Christian Community, Jarvain L. Bingmon is no stranger to building a sense of community. Here, Jarvain speaks about the revitalization of Conrad Park in New Orleans and how it strengthened the local community in the wake of Hurricane Katrina. "KaBOOM! has helped change the tide of New Orleans. I've been on several KaBOOM! 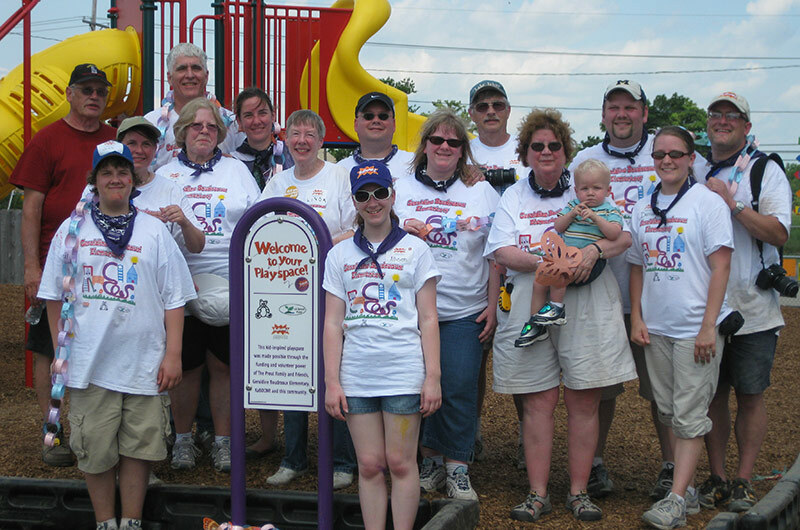 builds and experienced first-hand the power building playgrounds has on not just kids, but the entire community. Ten years ago, Hurricane Katrina destroyed both communities and morale across the Gulf Coast, leaving tangible marks and inflicting emotional scars on communities. Neighborhood parks were in need of some serious help but unfortunately, they were not the priority. Luckily, I was approached by KaBOOM! 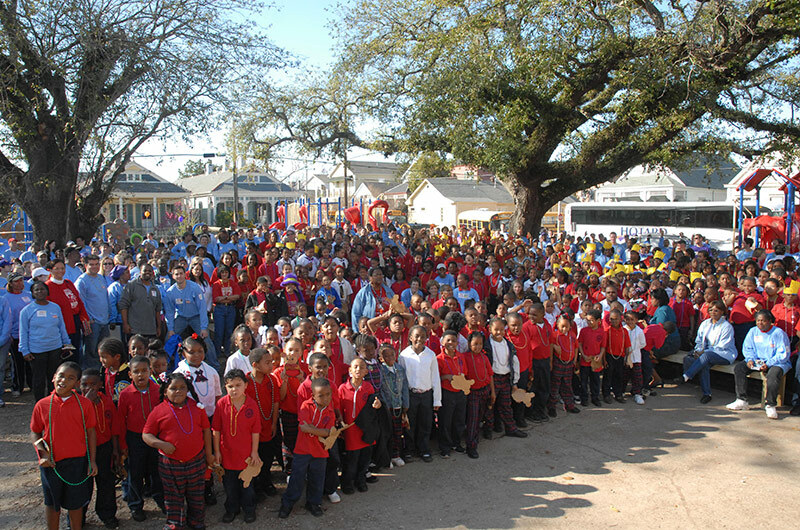 to build a new playground at Conrad Park in the Hollygrove community of New Orleans' 17th Ward shortly after Hurricane Katrina. Up until Build Day, the park was dormant and was ignored by the community. People were just too busy rebuilding their homes and their lives to think about the park. With the support of KaBOOM!, I enlisted the help of my neighbors, gathering everyone I knew that cared about Conrad Park. I gathered community members, students at local universities and everyone else that thought this was a good idea. And I'll tell you what, that KaBOOM! build has turned Conrad around. Since Build Day, the playground has drawn kids and families back to the park for a myriad of activities. Our community has come together and taken the park to a whole new level, showing us that we can build something beautiful and useful despite the hardships we've endured. 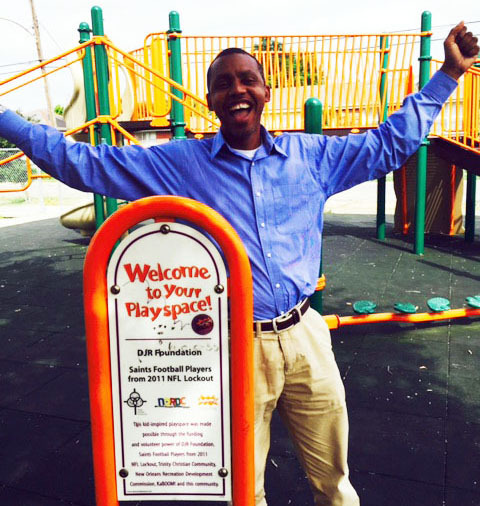 The playground catalyzed the revitalization of our neighborhood park. Conrad Park is now home to a park supervisor and an athletic director; boasts fitness programs like boot camps and Zumba; and has a new flood protection system redesigned by one of Louisiana's largest landscape architecture firms, Dana Brown & Associates, Inc., all of which was kicked off by the playground build." While every KaBOOM! 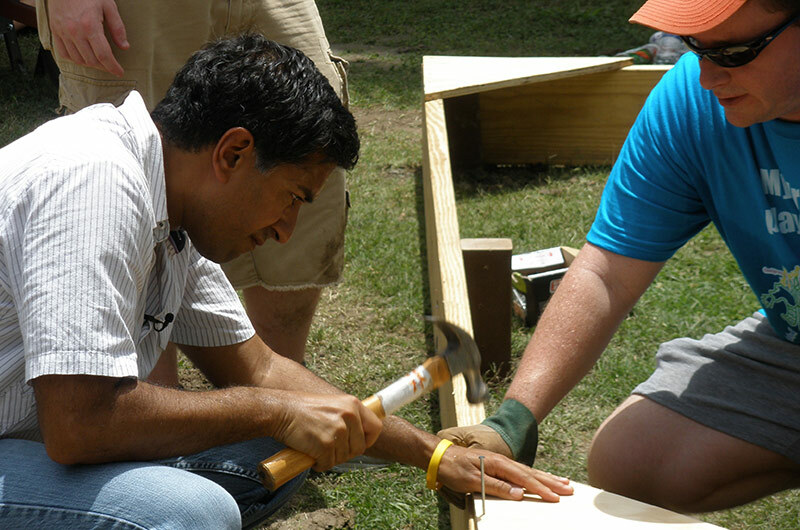 playground build is an inspiring event, the builds in honor of the 5th anniversary of Hurricane Katrina give volunteers a special chance to reflect on the storms' impact. KaBOOM! transformed empty lots into colorful new playgrounds in a single one day, making tangible progress that sparked neighbors to take on the larger problems the region continued to face. 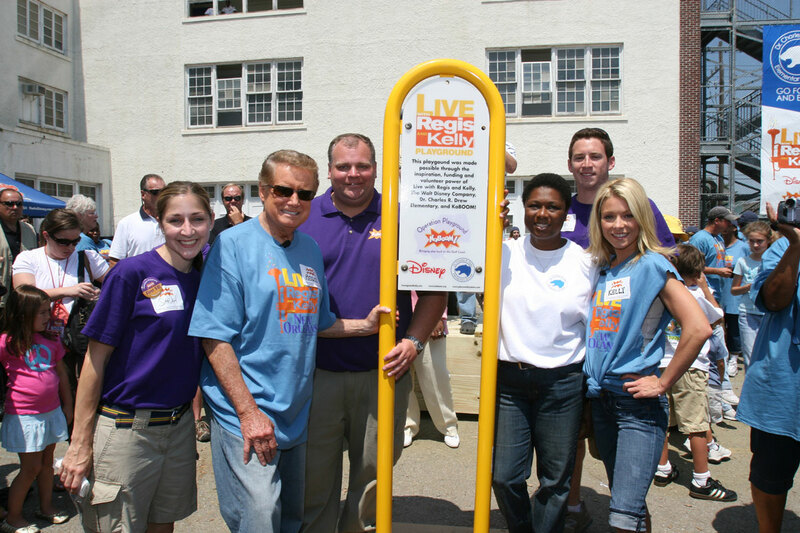 "Live with Regis and Kelly" supported our 50th playground build at Dr. Charles R. Drew Elementary School, a 600-student campus located in the Bywater neighborhood of New Orleans. Drew Elementary had sustained significant flooding and damage and as a result, the students and staff were displaced for well over a year. Drew Elementary re-opened in October 2006 and was the first school in the impacted to reopen. Before KaBOOM! and 'Live' built the new playground, the only place to play was lot behind the school with potholes, buckling asphalt and the remnants of what used to be a basketball court. Learn more. 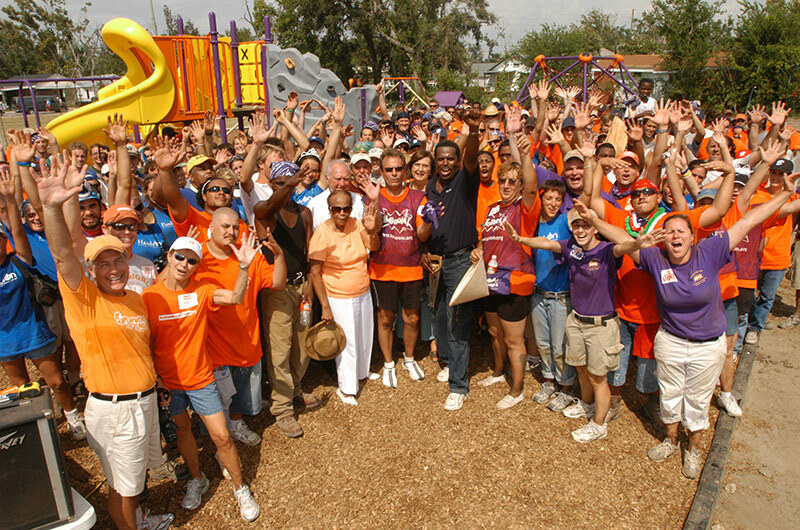 To commemorate the year-mark of Hurricane Katrina, KaBOOM!, The Home Depot Foundation, Playworld Systems and Hands On Network mobilized thousands of volunteers to build ten playgrounds across four days. KaBOOM! 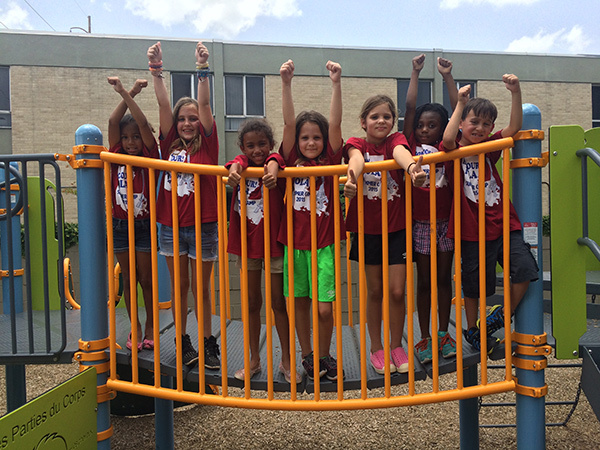 partnered with Fannie Mae to build six playgrounds in a single day at New Orleans schools. This is my life. This is what I do. I live here. I work here. I play here. This is real to me. We talk about Katrina, but KaBOOM! has helped to change the tide of this city. I know that the playgrounds that you all build change cities. I told the principal I was going to come down and take some pictures. When I pulled in, I started to get out, but then I sat in my car and bawled. You could hear them playing. I had forgotten that it didn't sound like a school until it sounded like a school again. This is an awesome and inspiring experience. This is our opportunity to make kids' dreams come true. How often do you get to do that at work? 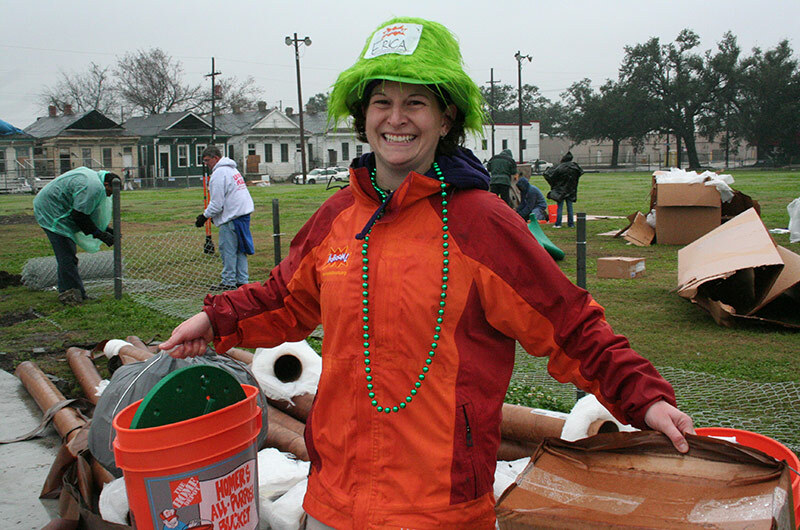 The mayor cooked jambalaya, we had over 650 volunteers on a cold, wet day and they built the playground, five planter benches, five picnic tables and garbage cans in record time. There was laughing, singing, just old fashioned joy… We were awash in happiness! So many people said that it was the first uplifting day since the storm. 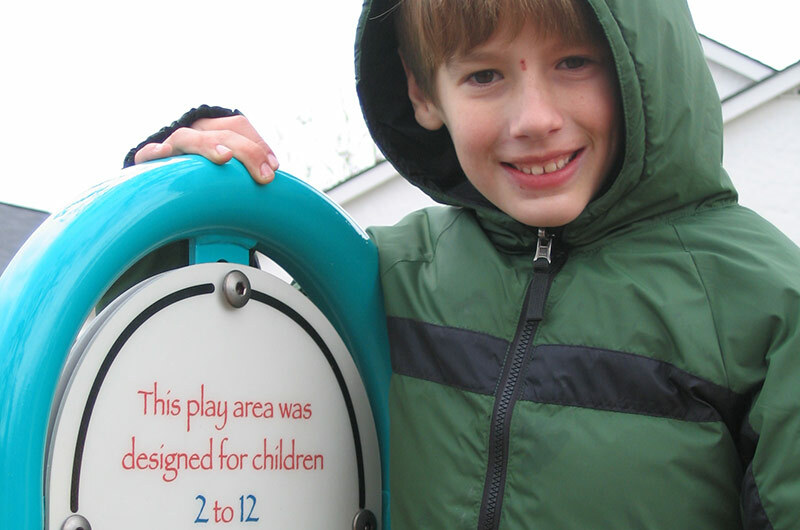 We knew playgrounds were critical to helping kids build resiliency and return to the normalcy of their lives. — Darell Hammond, CEO & Founder, KaBOOM!